From Las Torres, a fine hotel at the base of the mountains, it's an all-day hike, a round trip of nearly 12 miles with about 3,700 feet gain in elevation, to get this view of the towers. The first part of hike takes you up perhaps half the elevation, but then you lose much of it before hiking back up again. For that first part, you can rent a horse if you want. Yes, I wanted (somewhere I have a photo of me on the horse, fortunately for you -- actually, me -- I can't find it). The horse, I think, helped me conserve some energy for the rest of the day, especially when we got close, where the final treat awaits: You must climb up through a 500-foot boulder field (boulders ranging in size from footballs to large SUVs). Small blotches of spray paint mark the "path." At the base of the boulder field is a sign that points the way through the boulder field to the glacier-fed lake (Mirador) at the base of the towers. The climb will take 45 minutes, the sign says. Ha ha, such jokers these Chileans are. It took me about an hour-and-a-half. It seemed endless. Even after our guide came back down and helped with my backpack, I was exhausted at the finish. Especially when I pondered the climb down necessary to photograph at lake level. But when I got to the top, and the towers were revealed, I knew it was worth every second. This, however, isn't a story about how hard I had to work to get this photo. I'm just sayin': If someone tells you there's a great, but difficult, hike to be had -- or whatever the opportunity may be -- don't pass it up. I almost passed this one up. It was near the end of the trip; we were all very tired. It's not a new story moral, this is just my turn to say it. One more thing. 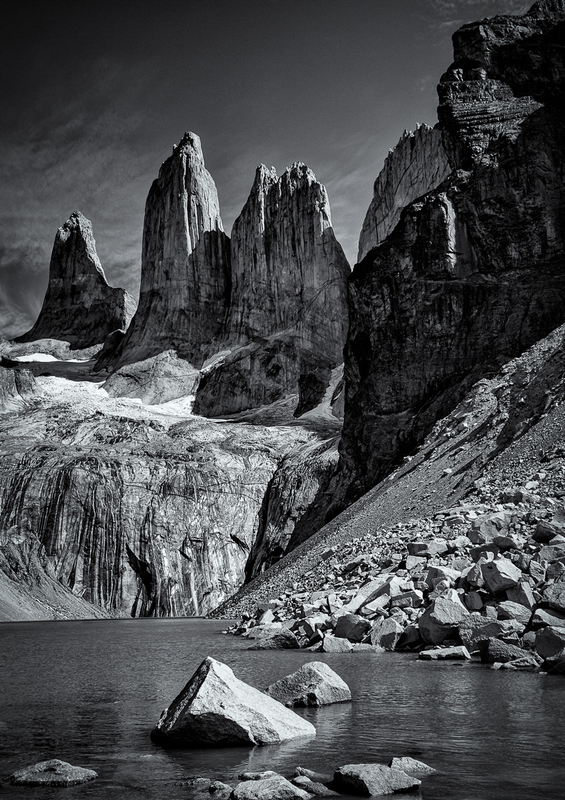 Go to Patagonia if you can, but be warned that you'll spend the rest of your life pining to go back.